With more than 900 locations and upwards of 60,000 employees, Carolinas HealthCare System gives new meaning to the phrase ‘go big or go home.’ It’s only fitting then, that its IT department is making a considerable impact – implementing solutions that coincide with the executive strategies of the system at large while keeping an eye trained to the ever-changing healthcare climate. It’s this integrative approach along with a total teamwork mindset that has played a key role in Carolinas’ IT success, according to Craig Richardville, CIO for the sprawling system, which happens to be the largest healthcare delivery network in the Southeast. “One of our secrets to success is to be extremely collaborative and take the total team approach,” Richardville said. The employees composing Carolinas’ IT team epitomize this total package; not only are they good listeners, but they also possess the ability to convince others of the power that technology holds for various functions in the healthcare world, Richardville noted. 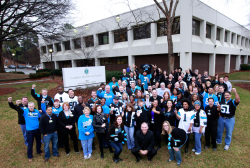 A dedication to patient care is also significant within the Carolinas IT ethos. What’s more, the IT team is very much a part of expanding and implementing the overarching framework that carries Carolinas forth – meaning they aren’t just listening to major discussions within the system – they’re also starting them. Despite the external, political factors that challenge the department currently and will continue to do so moving forward – the mounting regulations wracking health IT innovation have certainly kept the department on its toes – Richardville concurs that as long as such collaborative traits persist, Superman need not apply.